Ever since my birthday, I have become a huge skin care fanatic. I have been loving my Clarisonic Mia, and I haven't had better skin ever! Before using all of the products that I have now and the tools, my skin would go back and forth with being oily or having incredibly dry textures. Now I can safely say that it's regulated and it's all thanks to my new routine! I switch it up when night and day, but I would love to hear what products you use in the comments section! First Aid Beauty Face Cleanser - I have heard nothing but good things when it comes to this brand, so when it came time for me to get a new regular cleanser I decided to try it out! I have been loving how soft and clear it has been leaving my skin after a wash. The consistency makes it so you only need a little bit of it to work a long way. Benefit Triple Preforming Facial Emulsion - Thank you to the amazing ladies at the makeup counters at Macys for showing me this! I absolutely LOVE the smell of it after I put it on, and it leaves my face looking sooo good after! I do have to say that spending a couple of bucks on it, I do wish that the bottle was a little bit bigger, but it will have to do. Clarisonic Mia - I have been wanting to get a Clarisonic for a couple of years now ever since my best friend got hers and loved it. But I was lucky enough to have my amazing aunt buy it for me and I don't think I should go back to washing my face just with my hand! It goes so deep into my pores and makes a huge difference on how my skin looks the next day. 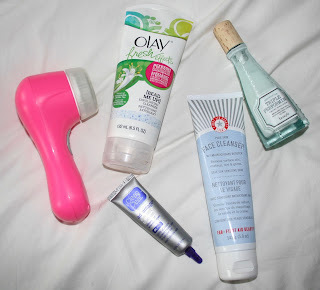 Olay Bead Me Up Exfoliating Cleanser - I was a little bit unsure on what type of face wash I should use when it came to the end of the day. But thankfully my eyebrow lady helped me with this and told me that I should try one of the Olay exfoliators when it came to that. Ever since, I have been obsessed with how much it has really opened up my pores and left me with much less breakouts. Clean and Clear Night-Time Deep Relaxing Face Wash - I switch off from the Olay Exfoliator and this Cleanser. I like how this cleanser is specifically towards night time and it purposefully to help you feel more relaxed. I do have to say that it doesn't leave my skin as good as the other one does, but I do recommend switching it out with an exfoliator every other night if you have pretty normal skin. What do you like to have in your skin routine?